Investigating Agatha Christie's Poirot: Digital restoration of the first six series! So cool. I love this show. I agree - it will be lovely to see it all in HD. Well, apart from series 7 and 8, apparently, because as I mention in the post, it seems they were only asked to restore the first six series. Anyway, we get the majority of the episodes in high quality, which is great! Hi there! I'm not much of a DVD expert, I'm afraid, but you could try Acorn's releases. 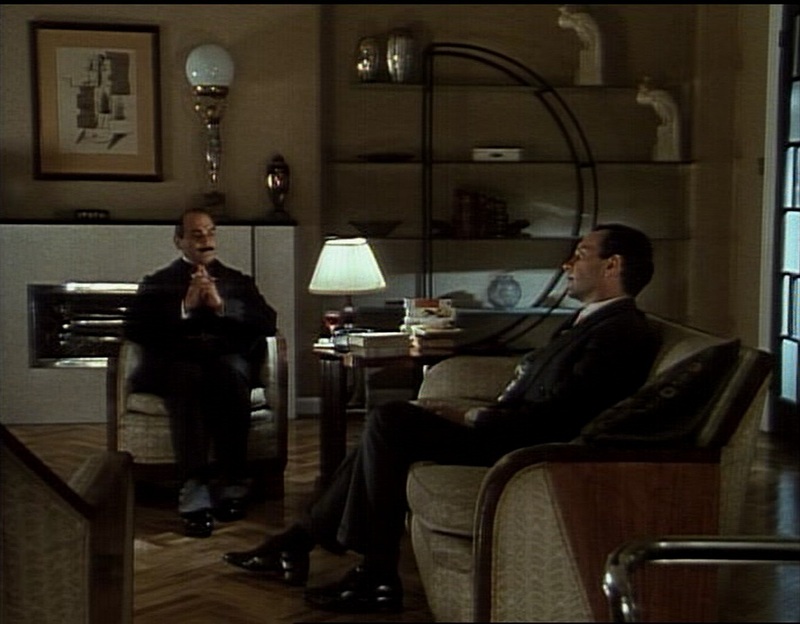 They're in the same DVD region, I believe: http://acornmediaau.com/catalogsearch/result/?q=Poirot&x=0&y=0. While that's nice, sadly however, to comply with ITV Studios rule, the LWT endboard was cut out and the copyright in the original closing credits was changed, similar to Jeeves and Wooster when I saw the final episode on Now TV where the Granada endboard is cut out and replaced with an animated ITV Studios Global Entertainment logo with music, some ITV regions endboards on shows like Heartbeat (Yorkshire) Wycliffe (HTV) are intact. Shame :(, but I wish ITV would show the original broadcast versions of both Jeeves and Wooster and Poirot again and release them on DVD again, for Poirot, it would be Agatha Christies Poirot: The Complete Classic Collection (which covers all of the pre-2003 Poirot episodes on a 5 disc set which contains all the images for all pre-2003 episodes), for Jeeves and Wooster, it would be Jeeves and Wooster: The Whole Jolly Lot Complete Collection: the 24th Anniversary Edition. Poirot (Series 1-Series 8) and Jeeves and Wooster have been horribly tampered with on their recent DVDs. Because ITV Studios Home Entertainment released them through themselves instead of Granada Ventures and Network, the 2011 restoration of Jeeves and Wooster suffers slight cropping (even though it is in its original aspect ratio), an edit to the final episode and the end caps changed (a copyright change and the ITV Studios logo plastering the Granada ones), while Poirot had two Granada logos plaster over the original LWT logos and the use of the original intro and closing credits in The ABC Murders, Death in the Clouds and One, Two, Buckle My Shoe (they originally had no intro and different credits which was retained through the early DVD prints from VCI). 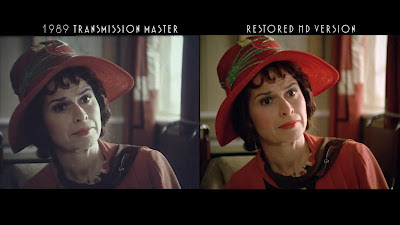 Taken to extreme for the JCA TV restorations of Poirot (Series 1-Series 8) were the copyright has been changed. Averted for the Network DVD releases of Granada and LWT shows which retain the respective endboard and copyright. Sharpe had a JCA TV restoration, but the episodes become widescreen, and has a ITV Studios logo at the beginning,, a copyright change, a logo plaster on the 1st episode, but it is good and the Central endboard is retained for episode 2 to episode 13 in a pseudo-widescreen (they were actualy made in fullscreen. Sharpe (the episodes from 1993 to 1997) had a bit of this for its recent DVD release, it may have a copyright change, a logo plaster on the 1st episode, released through ITV Studios Home Entertainment only, becomes Widescreen (though its a aversion), gains ITV Studios logos, though it retained the Central endboards for episode 2 to episode 13 and has a beautiful restoration. I'm aware of some of those unfortunate side-effects. I also noticed in one of the restored episodes that they had forgotten to include a very important on-screen caption (I think it was a reference to the year, 1936, possibly in Hercule Poirot's Christmas (I'd have to double check). I'm no tech expert, but from what I understand they did actually use the original transmission masters, but changed the end credits and the logos. I can agree that that's unfortunate, even if it does add a sense of consistency with the later episodes. I agree, Eirik, but to be precise, you must here this, Sharpe's classic episodes was filmed in Widescreen, and was shown in fullscreen for earlier TV transmissions and was presented that way for early DVDs, but when JCA came to restore that series, it was presented in its true aspect ratio of 1.78.1 Widescreen (though this had a side effect for the Central end boards from 1995 to 1997 to become pseudo-widescreen (they were actualy made in fullscreen, but this does not affect the Central end boards seen from those episodes from 1993 to 1994) which could be confusing), but the ITV Studios logo plasters over the original Central end board for Sharpe's Rifles, for and Wooster, its 2011 restoration has pleasing picture as with Sharpe's and Poirot's new restoration, it has slight cropping (even though it is in its original aspect ratio, you could notice that part of Bertie's hand is lost in the new restoration you could check the evidence here at https://www.sendspace.com/file/ighivj), an edit to the final episode (originally, the image freeze-frames on the two racing through the front gate before fading over to the animated band from the opening sequence, which bounces/dissolves into the white background as the final notes of the theme song play, but in the new 2011 restored DVD, the freeze-frame was cut and instead in its place, we slowly zoom into the angry wedding attendees chasing Bertie and Jeeves (they are offscreen during that chase) before fading over to the animated band from the opening sequence, which bounces/dissolves into the white background as the final notes of the theme song play) and the end caps changed (a copyright change and the ITV Studios logo plastering the Granada ones) and Now TV viewings of that series uses the original transmission masters unedited, but an animated recent ITV Studios Global Entertainment logo with music plasters over the Granada end board, some ITV regions end boards on shows like Heartbeat (Yorkshire) Wycliffe (HTV) are intact, in Poirot's case, it uses the original intro and closing credits in The ABC Murders, Death in the Clouds and One, Two, Buckle My Shoe (they originally had no intro and different credits which was retained through the early DVD prints from VCI, but The Mysterious Affair at Styles retains its no intro and different creditsness) since 2005, the Series 6 episodes of Poirot when released through VCI was identical or nearly identical to how it premiered, but they lose the special LWTP end board, while classic Poirot episodes from 1989 before the ITV generic logo, had a special still LWT logo with just a copyright that was plastered over by ITV generic logo era LWT end boards. Surely when the classic series of Poirot was released on DVD in 2005, a previous restoration (or enhancement) that is used on UK DVDs were the 1st to lose the LWT end boards and gain Granada logos and have end credits changes, then in 2010, a new restoration by JCA used the original transmission masters, but changed the end credits and the logos were the 2nd, basicly the post-2003 series were foreshadowing that the classic series will lose their LWT logos and be changed, Jeeves and Wooster fell victim when it was restored in 2011 by JCA (probably) when that used the original transmission masters, but changed the end credits, the logos, edited the final episode and slight cropping (even though it is in its original aspect ratio, you could notice that part of Bertie's hand is lost in the new restoration). but for The LWT Goodies and Forever Green since Network owns the DVD rights, the LWT logos are retained. Had Granada not become an media empire and not taken over LWT and the formation of ITV PLC did not happen, then, Jeeves and Wooster and the classic series of Poirot and the classic series Sharpe would be all presented in there original way (except that classic Sharpe would be presented in its true aspect ratio of 1.78.1 Widescreen). Hm, I think I see what you're getting at. That they changed and edited the logos is far from good, especially if this had an impact on what we see of the adaptation on screen. I can understand why they would want to change it, though, as ITV wanted to sell the restored episodes to broadcasters and DVD/blu-ray companies around the world, and having the same logo would make sense in terms of marketing and branding. However, I think you're absolutely right. The changes wouldn't have happened if the production company hadn't changed (LWT - Granada - ITV Studios). I agree, Eirik, but you may want to hear this, ITC cult shows through Network DVD remain unchanged, but lose the Compass and Spinning Diamonds and Return of The Saint has the Golden Tops plaster over the Spinning Diamonds on the last episode and the TV Movie on each disc (but on The Saint Complete Color Series, at the end of Vendetta for The Saint, is a rare ITC Entertainment end board which features the logo used in tandem with the Compass is retained), some people who don't like logo plastering and copyright changes and editing it will sometimes complain about that cause, the Series 6 episodes of Poirot when released through VCI was identical or nearly identical to how it premiered, but they lose the special LWTP end board and instead goes straight to the standard LWT end board at the time, while classic Poirot episodes from 1989 before the ITV generic logo, had a special still LWT logo with just a copyright that was plastered over by ITV generic logo era LWT end boards, and i did notice that when The ABC Murders, Death in the Clouds and One, Two, Buckle My Shoe were restored in 2005 and 2010 respectively the no intro and different creditsness is removed and the original intro and closing credits was added, thus making them longer then their original running time. Like i said before, when the classic series of Poirot was released on DVD in 2005, a previous restoration (or enhancement) that is used on UK DVDs were the 1st to lose the LWT end boards and gain Granada logos and have end credits and opening changes on The ABC Murders, Death in the Clouds and One, Two, Buckle My Shoe, then in 2010, a new restoration by JCA used the original transmission masters, but changed the end credits (which was the copyright notice, and the addition of a copyright notice on series 1 episodes of Poirot were the 2nd, basically the post-2003 series were foreshadowing that the classic series will lose their LWT logos and be changed, Jeeves and Wooster fell victim when it was restored in 2011 by JCA (probably) when that used the original transmission masters, but changed the end credits, the logos, edited the final episode and slight cropping (even though it is in its original aspect ratio, you could notice that part of Bertie's hand is lost in the new restoration). but for LWT series of The Goodies and Forever Green since Network owns the DVD rights for those series, the LWT logos are retained. Had Granada not become an media empire and not taken over LWT and the formation of ITV PLC did not happen, then, Jeeves and Wooster and the classic series of Poirot and the classic series Sharpe would be all presented in there original way (except that classic Sharpe would be presented in its true aspect ratio of 1.78.1 Widescreen) if the production company hadn't changed (LWT - Granada - ITV Studios). I might check the restored version of Hercule Poirot's Christmas to see if the very important on-screen caption is removed. Eirik, you may want to hear this, ITC cult shows through Network DVD remain unchanged, but lose the Compass and Spinning Diamonds and Return of The Saint has the Golden Tops plaster over the Spinning Diamonds on the last episode and the TV Movie on each disc (but on The Saint Complete Color Series, at the end of Vendetta for The Saint, is a rare ITC Entertainment end board which features the logo used in tandem with the Compass is retained), some people who don't like logo plastering and copyright changes and editing it will sometimes complain about that cause, the Series 6 episodes of Poirot when released through VCI was identical or nearly identical to how it premiered, but they lose the special LWTP end board and instead goes straight to the standard LWT end board at the time, while classic Poirot episodes from 1989 before the ITV generic logo, had a special still LWT logo with just a copyright that was plastered over by ITV generic logo era LWT end boards, and i did notice that when The ABC Murders, Death in the Clouds and One, Two, Buckle My Shoe were restored in 2005 and 2010 respectively the no intro and different creditsness is removed and the original intro and closing credits was added, thus making them longer then their original running time. Like i said before, when the classic series of Poirot was released on DVD in 2005, a previous restoration (or enhancement) that is used on UK DVDs were the 1st to lose the LWT end boards and gain Granada logos and have end credits and opening changes on The ABC Murders, Death in the Clouds and One, Two, Buckle My Shoe, then in 2010, a new restoration by JCA used the original transmission masters, but changed the end credits (which was the copyright notice, and the addition of a copyright notice on series 1 episodes of Poirot were the 2nd, basically the post-2003 series were foreshadowing that the classic series will lose their LWT logos and be changed, Jeeves and Wooster fell victim when it was restored in 2011 by JCA (probably) when that used the original transmission masters, but changed the end credits, the logos, edited the final episode and slight cropping (even though it is in its original aspect ratio, you could notice that part of Bertie's hand is lost in the new restoration). but for LWT series of The Goodies and Forever Green since Network owns the DVD rights for those series, the LWT logos are retained. Had Granada not become an media empire and not taken over LWT and the formation of ITV PLC did not happen, then, Jeeves and Wooster and the classic series of Poirot and the classic series Sharpe would be all presented in there original way (except that classic Sharpe would be presented in its true aspect ratio of 1.78.1 Widescreen) if the production company hadn't changed (LWT - Granada - ITV Studios). But the JCA restoration to Poirot and Jeeves and Wooster is good anyway, despite the flaws of logo plastering, editing, copyright changes and slight cropping on Jeeves and Wooster . Eirik, While that restoration was nice. sadly, it has some bad side-affects to it, this even goes to Jeeves and Wooster and Sharpe's Rifles, here is a bit of this, Poirot (Series 1-Series 8) and Jeeves and Wooster have been horribly tampered with on their recent DVDs. Because ITV Studios Home Entertainment released them through themselves instead of Granada Ventures and Network, the 2011 restoration of Jeeves and Wooster suffers slight cropping (even though it is in its original aspect ratio), an edit to the final episode and the end caps changed (a copyright change and the ITV Studios logo plastering the Granada ones), while Poirot had two Granada logos plaster over the original LWT logos and the use of the original intro and closing credits in The ABC Murders, Death in the Clouds and One, Two, Buckle My Shoe (they originally had no intro and different credits which was retained through the early DVD prints from VCI). 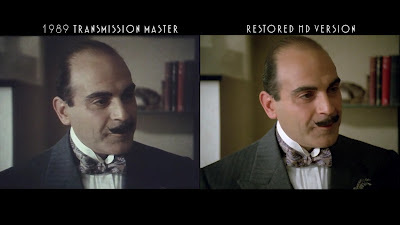 Taken to extreme for the JCA TV restorations of Poirot (Series 1-Series 8) were the copyright has been changed. Averted for the Network DVD releases of Granada and LWT shows which retain the respective endboard and copyright, while Sharpe (the episodes from 1993 to 1997) had a bit of this for its recent DVD release, it may have a copyright change, a logo plaster on the 1st episode, released through ITV Studios Home Entertainment only, becomes Widescreen (though its a aversion because it was filmed in Widescreen, and was shown in fullscreen for earlier TV transmissions and was presented that way for early DVDs), gains ITV Studios logos, though it retained the Central endboards for episode 2 to episode 13 and has a beautiful restoration, but theirs a side-effect for Central endboards with color backgrounds and they become pseudo-widescreen, but is still a beautiful restoration in merit unlike Poirot and Jeeves and Wooster . Eirik, you might know that not only classic Poirot had bad side-effects between the 2005 restoration and JCA restoration, Series 9 did, in the form of gaining black closing credits for post-2006 reruns and i saw Sad Cypress on Now TV back in June, and it did have the black closing credits, also ITC cult shows through Network DVD remain unchanged, but lose the Compass and Spinning Diamonds and Return of The Saint has the Golden Tops plaster over the Spinning Diamonds on the last episode and the TV Movie on each disc (but on The Saint Complete Color Series, at the end of Vendetta for The Saint, is a rare ITC Entertainment end board which features the logo used in tandem with the Compass is retained), some people who don't like logo plastering and copyright changes and editing it will sometimes complain about that cause, the Series 6 episodes of Poirot when released through VCI was identical or nearly identical to how it premiered, but they lose the special LWTP end board and instead goes straight to the standard LWT end board at the time, while classic Poirot episodes from 1989 before the ITV generic logo, had a special still LWT logo with just a copyright that was plastered over by ITV generic logo era LWT end boards, and i did notice that when The ABC Murders, Death in the Clouds and One, Two, Buckle My Shoe were restored in 2005 and 2010 respectively the no intro and different creditsness is removed and the original intro and closing credits was added, thus making them longer then their original running time. Like i said before, when the classic series of Poirot was released on DVD in 2005, a previous restoration (or enhancement) that is used on UK DVDs were the 1st to lose the LWT end boards and gain Granada logos and have end credits and opening changes on The ABC Murders, Death in the Clouds and One, Two, Buckle My Shoe, then in 2010, a new restoration by JCA used the original transmission masters, but changed the end credits (which was the copyright notice, and the addition of a copyright notice on series 1 episodes of Poirot were the 2nd, basically the post-2003 series were foreshadowing that the classic series will lose their LWT logos and be changed, Jeeves and Wooster fell victim when it was restored in 2011 by JCA (probably) when that used the original transmission masters, but changed the end credits, the logos, edited the final episode and slight cropping (even though it is in its original aspect ratio, you could notice that part of Bertie's hand is lost in the new restoration). but for LWT series of The Goodies and Forever Green since Network owns the DVD rights for those series, the LWT logos are retained. Had Granada not become an media empire and not taken over LWT and the formation of ITV PLC did not happen, then, Jeeves and Wooster and the classic series of Poirot and the classic series Sharpe would be all presented in there original way (except that classic Sharpe would be presented in its true aspect ratio of 1.78.1 Widescreen) if the production company hadn't changed (LWT - Granada - ITV Studios). I hate how recent airings of old tv shows, while remastering, get the original closing logos (you know, the ones that appeared on that particular programme when it was originally broadcast), get edited out and replaced with newer ones, it really disappoints me because I certainly know which company made them at the time, but then suddenly their logo from the era doesn't appear at the end of them. For example, I was watching Soldier Soldier on Sony TV, M>Movies and Movies4Men recently and was expecting a Central endcap but unfortunately it got edited out and replaced by an ITV Studios Global Entertainment. Additionally, the sixth and seventh seasons of Soldier Soldier on Network DVD have the central endcap edited out and replaced by either CTE's logo or even Granada International Media's logo. I've also seen this happen on repeat showings of Minder with the original Thames and Central logos gone too. Not good is it. Whats your name, but by the way, i have the digitally remastered Jeeves and Wooster on DVD, and one thing i was angered about it was that a ITV Studios Global Entertainment logo replaces the Granada logos on all episodes, and and was slightly cropped (even though it is in its original aspect ratio) which chopped part of Bertie Wooster's hand in episode 1 of the third series to Jeeves and Wooster and an edit to the final episode (originally, the image freeze-frames on the two racing through the front gate before fading over to the animated band from the opening sequence, which bounces/dissolves into the white background as the final notes of the theme song play, but in the new 2011 restored DVD, the freeze-frame was cut and instead in its place, we slowly zoom into the angry wedding attendees chasing Bertie and Jeeves (they are offscreen during that chase) before fading over to the animated band from the opening sequence, which bounces/dissolves into the white background as the final notes of the theme song play) and the end caps changed (a copyright change and the ITV Studios logo plastering the Granada ones) and Now TV viewings of that series uses the original transmission masters unedited, but an animated recent ITV Studios Global Entertainment logo with music plasters over the Granada end boardt. When it came to Poirot, the Series 6 episodes of Poirot when released through VCI was identical or nearly identical to how it premiered, but they lose the special LWTP end board and instead goes straight to the standard LWT end board at the time, while classic Poirot episodes from 1989 before the ITV generic logo, had a special still LWT logo with just a copyright that was plastered over by ITV generic logo era LWT end boards, and i did notice that when The ABC Murders, Death in the Clouds and One, Two, Buckle My Shoe were restored in 2005 and 2010 respectively the no intro and different creditsness is removed and the original intro and closing credits was added, thus making them longer then their original running time. 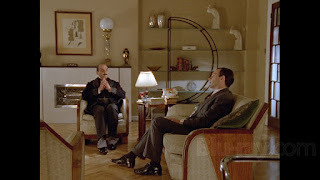 Like i said before, when the classic series of Poirot was released on DVD in 2005, a previous restoration that is used on UK DVDs were the 1st to lose the LWT end boards and gain Granada logos and have end credits and opening changes on The ABC Murders, Death in the Clouds and One, Two, Buckle My Shoe, then in 2010, a new restoration by JCA used the original transmission masters, but changed the end credits (which was the copyright notice, and the addition of a copyright notice on series 1 episodes of Poirot), basically the post-2003 series were foreshadowing that the classic series will lose their LWT logos and be changed, but for LWT series of The Goodies and Forever Green since Network owns the DVD rights for those series, the LWT logos are retained. Had Granada not become an media empire and not taken over LWT and the formation of ITV PLC did not happen, then, Jeeves and Wooster and the classic series of Poirot and the classic series Sharpe would be all presented in there original way (except that classic Sharpe would be presented in its true aspect ratio of 1.78.1 Widescreen) if the production company hadn't changed (LWT - Granada - ITV Studios). And I have the Sharpe Classic Collection boxset from 2013, and Sharpe's Rifles does not end with a Central endcap and instead ends with the ITV Studios Global Entertainment logo, but Classic Sharpe is close to proper restoration, thanks to the Central endboards for episode 2 to episode 13 being retained. BTW, My name is Guy Palmer. So your name is Guy Palmer, what a nice name, I know how you feel about the hatred of logo plastering, I saw one Blockbusters episode with the original copyright, but the ITV Studios Global Entertainment logo plasters the Central endboard, Not so good! You may also know that i have the entire Sherlock Holmes series with Jeremy Brett, and that the Granada logo from the early 2000s (the same one that plastered the LWT logo on the Poirot series 1-6 restoration from 2005) ends up plastering the old Granada endboards on all episodes despite that its the same company and the episodes before 1988 (as standard, regional ITV logos no longer appeared at the start of their programmes since 1988) have the opening Granada logos cut out and instead starts when the opening credits begin, but i have the ITV DVD print of the entire Jeeves and Wooster and it retains the old Granada logos, also i have the MPI region 1 print of The Adventures of Sherlock Holmes and that retains the old Granada logos at both the start and end because it was sourced from the original negative anyway. Granada and ITV Studios are pretty stupid when it comes to plastering there logos on their own shows (including a 2000s era Granada logo plastering older Granada logos, which is senseless because Granada should not plaster there own older logos with recent ones because they did not exist at the time of the older logos), editing them, as well as changing the copyright. And another thing, i have the digitally remastered Jeeves and Wooster on DVD, and one thing i was angered about it was that a ITV Studios Global Entertainment logo replaces the Granada logos on all episodes, and and was slightly cropped (even though it is in its original aspect ratio) which chopped part of Bertie Wooster's hand in episode 1 of the third series to Jeeves and Wooster and an edit to the final episode (originally, the image freeze-frames on the two racing through the front gate before fading over to the animated band from the opening sequence, which bounces/dissolves into the white background as the final notes of the theme song play, but in the new 2011 restored DVD, the freeze-frame was cut and instead in its place, we slowly zoom into the angry wedding attendees chasing Bertie and Jeeves (they are offscreen during that chase) before fading over to the animated band from the opening sequence, which bounces/dissolves into the white background as the final notes of the theme song play) and the end caps changed (a copyright change and the ITV Studios logo plastering the Granada ones) and Now TV viewings of that series uses the original transmission masters unedited, but an animated recent ITV Studios Global Entertainment logo with music plasters over the Granada end boardt. When it came to Poirot, the Series 6 episodes of Poirot when released through VCI was identical or nearly identical to how it premiered, but they lose the special LWTP end board and instead goes straight to the standard LWT end board at the time, while classic Poirot episodes from 1989 before the ITV generic logo, had a special still LWT logo with just a copyright that was plastered over by ITV generic logo era LWT end boards, and i did notice that when The ABC Murders, Death in the Clouds and One, Two, Buckle My Shoe were restored in 2005 and 2010 respectively the no intro and different creditsness is removed and the original intro and closing credits was added, thus making them longer then their original running time. Like i said before, when the classic series of Poirot was released on DVD in 2005, a previous restoration that is used on UK DVDs were the 1st to lose the LWT end boards and gain Granada logos and have end credits and opening changes on The ABC Murders, Death in the Clouds and One, Two, Buckle My Shoe, then in 2010, a new restoration by JCA used the original transmission masters, but changed the end credits (which was the copyright notice, and the addition of a copyright notice on series 1 episodes of Poirot), basically the post-2003 series were foreshadowing that the classic series will lose their LWT logos and be changed, but for LWT series of The Goodies and Forever Green since Network owns the DVD rights for those series, the LWT logos are retained. Had Granada not become an media empire and not taken over LWT and the formation of ITV PLC did not happen, then, Jeeves and Wooster and the classic series of Poirot and the classic series Sharpe would be all presented in there original way (except that classic Sharpe would be presented in its true aspect ratio of 1.78.1 Widescreen) if the production company hadn't changed (LWT - Granada - ITV Studios). And I have the Sharpe Classic Collection boxset from 2013, and Sharpe's Rifles does not end with a Central endcap and instead ends with the ITV Studios Global Entertainment logo, not so good, but Classic Sharpe is close to proper restoration, thanks to the Central endboards for episode 2 to episode 13 being retained. And speaking of logo plastering, Eirik, you may know that i have the entire Sherlock Holmes series with Jeremy Brett, and that the Granada logo from the early 2000s (the same one that plastered the LWT logo on the Poirot series 1-6 restoration from 2005) ends up plastering the old Granada endboards on some episodes despite that its the same company and the episodes before 1988 (as standard, regional ITV logos no longer appeared at the start of their programmes since 1988) have the opening Granada logos cut out and instead starts when the opening credits begin, but i have the ITV DVD print of the entire Jeeves and Wooster and it retains the old Granada logos, also i have the MPI region 1 print of The Adventures of Sherlock Holmes and that retains the old Granada logos at both the start and end because it was sourced from the original negative anyway. "I hate how recent airings of old tv shows, while remastering, get the original closing logos (you know, the ones that appeared on that particular programme when it was originally broadcast), get edited out and replaced with newer ones, it really disappoints me because I certainly know which company made them at the time, but then suddenly their logo from the era doesn't appear at the end of them." "For example, I was watching Soldier Soldier on Sony TV, M>Movies and Movies4Men recently and was expecting a Central endcap but unfortunately it got edited out and replaced by an ITV Studios Global Entertainment. Additionally, the sixth and seventh seasons of Soldier Soldier on Network DVD have the central endcap edited out and replaced by either CTE's logo or even Granada International Media's logo. I've also seen this happen on repeat showings of Minder with the original Thames and Central logos gone too. Not good is it." I am! So sorry for the late reply! A very happy new year to you too! Will have to look into the petition option. Fast Affordable Investigations is a leading private investigation agency serving South Florida, including Miami Beach, Miami, Fort Lauderdale, Boca Raton, Delray Beach, West Palm Beach, and surrounding areas.